News Dartmouth Festivals working together! Dart Music Festival chairman Robin Foale is really keen that we work with the committees of the other festivals in our town where there are crossovers in ensuring we all succeed. To that end, we are pleased to share details of the “Regatta Ball” that is coming up on 22nd August, and a special screening run by the Food Festival. This year’s theme will be Regatta Masquerade Ball! The Masquerade theme runs through the night and we encourage everyone attending to go all out and come along with the most extravagant mask they can find or make. There will be a magnum of champagne given on the night for the most impressive mask. There will be cocktails flowing and roulette and black jack tables for all to enjoy at the casino! Dinner is served at 7.45pm and accompanied by the soulful sounds of Caddick and Parkes. The dexterous skills of pianist Paul Caddick combined with the vocal talent of singer Nicky Parkes perform a range of songs spanning over 75 years of popular music. After dinner comes the highlight of the night, the one and only Joey the Lips who will get everyone up on the dance floor. Hailed as the nation’s funkiest band, this 10 piece line up are electric. Joey the Lips gigs are performed as a show, rather than solely a rendition of the music. It’s now a huge 20 years on the road during which the band has played over 1000 gigs throughout the UK and Europe across a huge variety of venues. Table of 10 can be purchased for the discounted price of £500. Individual tickets are £55 per person. The price includes a delicious three-course dinner provided by The Royal Castle Hotel as well as a fabulous line up of entertainment. The evening starts at 7pm and ends at 12.30am. Return coach travel to and from the Regatta Ball will be available from The Royal Seven Stars in Totnes on the night for only £10 per person. On Thursday 28th September Dartmouth Food Festival, in association with the local Marine Conservation Society (MCS), host a special screening of “A Plastic Ocean” at The Flavel to raise awareness of its commitment in steps to becoming a plastic free festival. More than 8 million tonnes of plastic is dumped in our oceans every year and a piece of plastic takes 500 years before it completely degrades. This all risks marine life and is finding its way into our food chain with serious consequences. The Dartmouth Food Festival takes place on the banks of the River Dart, which flows into one of the busiest waterways of the world and we are playing our part in tackling the growing environmental crisis caused by unwanted plastics. The Festival is, and has always been, committed to responsible food sourcing, reducing food miles and maintaining welfare standards. This year, we are striving further still to increase our sustainability and beginning the journey to becoming part of the solution and not a part of the problem. This year, the Festival will be reducing single use plastics and moving towards 100% use of compostable cutlery, cups, plates and packaging. This will allow us to dispose of the inevitable food waste together with what we eat it with and from, in a greener way! We are delighted to welcome Sir Geoffrey Newman (past chair of MCS), Matt Harvey (British humourist, performance poet and author) and Rebecca Hosking (BBC film maker turned pioneer) as speakers beforehand. Arrive at 7pm for 7.30pm start and enjoy complimentary canapes in the foyer. Tickets are £10 and are available via www.dartmouthfoodfestival.com/Events. 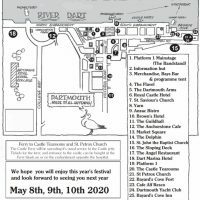 All profits will be split between the Dartmouth Food Festival and the local branch of the Marine Conservation Society.